A miserably wet Friday morning in Dublin with the Small Girl? Nothing for it but head straight for bakery and cafe Il Valentino on the Grand Canal. I’ve been looking for an excuse to visit since An American in Ireland organised an IFBA Foodies on Tour visit there. I’m a Real Bread fan – no preservatives, no additives, made with time and care – and her post about the event had grabbed my attention. With the Small Girl’s drenched buggy tucked into an adjacent corner, I settled down at a table with an aromatic Americano. Of course, with it raining outside, there was no point in facing the world for a while so it was also worth ordering a little heart-shaped chocolate cake (for me) and some breadsticks (Small Girl sorted). I was tempted to browse the books on a nearby shelf but ended up falling into conversation, as you do in a friendly space, with a random fellow foodie who happened to own a small boy that my SG was making eyes at. Babies all happy, cooing at each other, we were able to get straight down to the serious business of exchanging restaurant tips and recommendations. While the cosy cafe space fills up quickly on a rainy day as lunchtime approaches, Il Valentino scores highly on coffee, cake, the Italian country bread that I brought home (made great bruschetta) and the quality of its regulars. 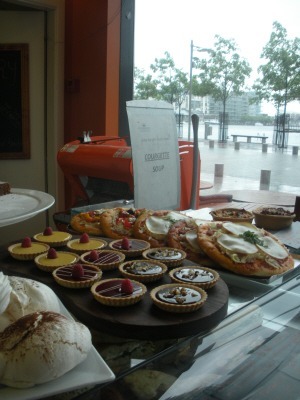 Il Valentino Continental Bakery, 5 Gallery Quay, Grand Canal, Dublin 2. Although tempted by the courgette soup and focaccia arriving out on the counter for lunch, we couldn’t spend the entire day there (people were now trying to squeeze themselves past the buggy) so, after a quick whizz around the shops – and getting even wetter – we took ourselves to the Fallon & Byrne restaurant for lunch. 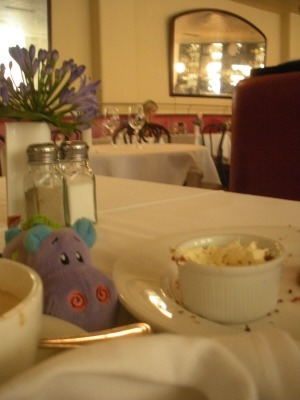 The maître d didn’t even blink when this bedraggled pair turned up in front of him. A request for “a table for one and a half” had us sitting down in a handy corner with a high seat for the Small Girl just before she could decide a pre-lunch meltdown was on the cards. Table service is a huge advantage when you’re trying to shovel food as fast as possible into a constantly open mouth – and there was enough space so that the buggy wasn’t creating a fire hazard. A punchy salad of zesty pink grapefruit and orange was a bright plate for a grey day, with fresh greens, crunchy pieces of sugar snap peas, sweet candied pumpkin seeds and a light citrus yoghurt dressing. Best of all, it was the kind of lunch that happily sat and waited until the Small Girl had decided to concentrate on the bread basket – the tomato and fennel flavour was greeted with loud gurgles of appreciation. I finished with a(nother) coffee, some cookies and cream – and the use of a phone belonging to a rather startled gent at the neighbouring table; mine had unexpectedly flatlined and I desperately needed to liaise with my lift home. I didn’t have a clue where the nearest payphones was and any searching would be made difficult with that torrential rain and a Small Girl who was thinking of nap time. Would you let a random person use your phone? I’m very glad that this man did. Fallon & Byrne Restaurant, 11- 17 Exchequer Street, Dublin 2. Living in the country, it’s easy to depend on your neighbours and to fall into conversation with people in shops. With the kindness of strangers and making unexpected acquaintances in good food spots, Dublin can be just the same. I like random men! They’re always good!